Memorable craft for little ones…and parents! She started with your basic set of fingerpaints, large paper and of course, her two toddlers! She let the kids go nuts outside with the various colors of fingerpaint. Along with their crazy splashing across the page, each toddler thought it fun to make their own handprints on different pieces of paper as well. Once it was dry, she noticed some really fun coloring combinations along with some interesting lines in her little ones artwork. She had some extra frames and decided to see what they looked like. Then she found the pages with the handprints on them and had one of those “lightbulb” moments! 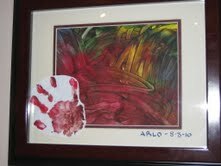 She cut out the handprints, framed the large pages and placed the handprint on top of the matted artwork. She finished it off with each childs name and date and voilá! She had a beautiful piece of memorable artwork to perch on her wall that not only looked nice, but was a great positive reminder to her and her little ones of the days fun and the creative powers of those little minds! Thanks for sharing, Meggin! If you or someone you know has a great craft or creative activity for young children, please submit them to us at info@mytimecalendars.com with subject line of “creative fun”.